The final lap for greyhounds in Mass. The greyhounds will bolt from the gate for the last time in Massachusetts today, marking the end of 75 years of live dog racing in the state. Voters last year elected by a wide margin, 56 percent to 44 percent, to ban the sport effective Jan. 1, 2010. Wonderland held its last race in September. Raynham Park stages its final race tonight. Both will continue to offer simulcasting - enabling patrons to wager on televised dog and horse races conducted elsewhere - at least through July 31, as a result of recently enacted legislation. The end of racing here is part of a national trend, driven by a mix of animal-rights concerns, waning attendance at dog tracks, and new statutes enacted by legislatures and voters. The last race at Raynham, previously known as Raynham-Taunton Greyhound Park, also marks the end of live dog racing in New England, for now at least. Live racing has ceased in recent years in Maine, New Hampshire, Connecticut, and for now Rhode Island - where its future at Lincoln’s financially strapped Twin River is in limbo - and after today will exist at just 23 tracks in seven states, 13 of them in Florida, according to GREY2K. There were 49 tracks in 15 states when GREY2K began in 2001. Attention now turns to greyhound adoption and to the financial future of the state’s two dog tracks, whose owners hope to stay in business as slot parlors - a possibility that will be debated on Beacon Hill in the coming months, along with the prospect of full resort-casinos. In the debate over racing, proponents of the ban deemed the sport cruel, calling attention to the cages where the dogs were kept and the 800 injuries suffered by racing greyhounds in the preceding six years. Racing supporters countered that the dogs were well protected and fed, said only a small percentage of dogs were injured, and called the ballot measure a move to put dogs over people, warning of up to 1,000 layoffs. 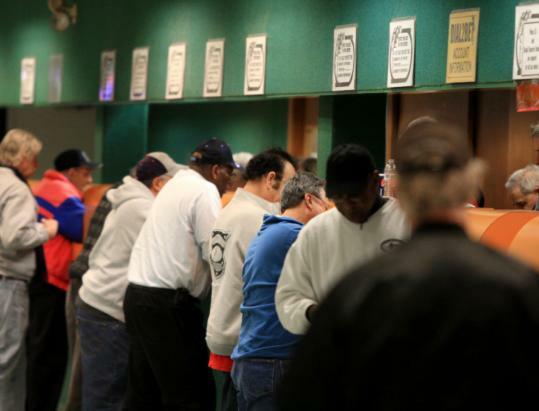 George Carney, Raynham’s owner, told the Globe earlier this month that he was laying off about one-third of his 600 part-time and full-time employees with the end of live racing but could sustain the full workforce if slot machines were allowed. At the same time, he and others are also mourning the end of an era. Many of the dogs, maintained by a network of kennels, will move on to race in other states, but several hundred will be looking for new homes. Raynham is working with GREY2K and the Massachusetts Society for the Prevention of Cruelty to Animals-Angell Animal Medical Center to aid their adoption.